Was Alan Virdon's ANSA spacecraft equipped with an advanced warp drive? Q: Was Alan Virdon's ANSA spacecraft equipped with an advanced warp drive? A: There is evidence that Virdon's spacecraft was far more advanced than Taylor's spacecraft. 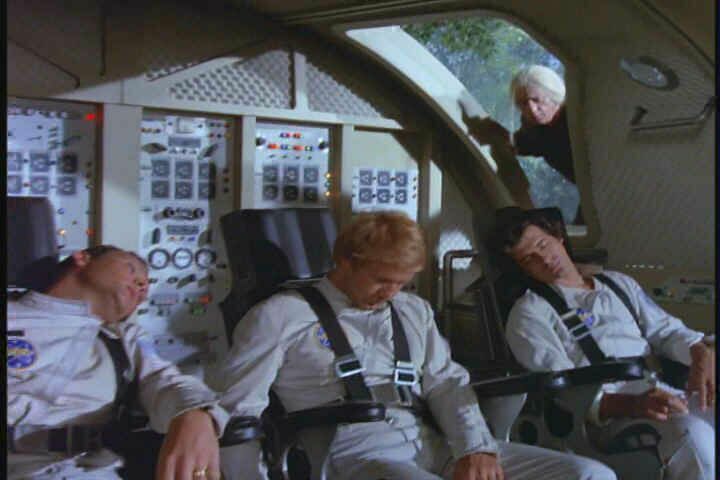 In the first movie, we have indication that space flight to another star is a tedious and very time consuming venture often requiring that the crew be placed in suspended animation for months or years at a time. When we get our first good look inside the second type of ANSA spacecraft, we see that it is constructed for apparently short term flight, since it has no facilities for suspended animation. In fact, looking at the evidence given for the hardware in the TV series, flight to another star may be a matter of only a few hours effort! Looking at the exterior of Virdon's craft, we see that the tail section is composed of some kind of heat shield similar to the types used on Apollo capsules. The two concentric rings of varying diameter and the multiple holes indicate that there was, again, more to this spacecraft than we see. The faster than light drive section would attach to the rear of the ANSA spacecraft. I would suggest that the holes visible in the space-frame are not some type of thruster jets for control, but rather were either explosive bolts used to jettison the FTL drive in an emergency situation or they could be network connection points to allow the onboard computer systems to interface with the hardware in the tail section. Looking at the rear of the spacecraft shows two interesting concentric circles that make the vessel appear as if it were housed slightly within another, larger body or the drive section, a form fitting power / drive section, similar to how a bullet fits into the cartridge case. You will also notice the absence of any kind of hatch or gangway from the command capsule to any other part of the ship, meaning that this spacecraft was designed for very high velocity, very short duration flights, much like a modern jet airliner. Alan Virdon's spacecraft could very well be the first ANSA faster than light vessel and if such, it is a far more advanced form of spacecraft than Taylor was in command of. You will notice that the spacecraft is not designed to be exited other than when it lands or makes reentry, since opening the only hatch the spacecraft has would expose the astronauts to vacuum or worse (the effects of the faster than light drive, stellar radiation, etc.). Since there is also no indication of any hatchway leading from the command capsule to any other part of the ship other than outside, the rest of the vessel is apparently designed to be monitored and operated solely from the command capsule using the controls and systems found there. These controls are apparently intended to be accessed from the seats without the astronauts having to remove their harnesses. Images found in the photo gallery clearly show that these types of seats, far different than those found in Taylor's spacecraft, can not only rotate from side to side, but also move forward and backwards on tracks, allowing the astronauts to swivel in place to reach controls to each side of them, as well as move forward or back to access controls in front of them and behind them. What also gives proof to this argument is the chronometer on Alan Virdon's spacecraft. In the opening sequences of the TV series, we see that the Earth-time and spacecraft-time are the exact same, meaning that Virdon is not traveling at high relativistic velocities, but rather that his spacecraft was of such advanced design that it could travel very large interstellar distances in a very short period of time, avoiding the trap of objective / subjective time passage. Whether this propulsion was the form of actually flying through space at FTL velocities using a warp envelope (like the UFP Enterprise does in Star Trek) or by entering hyperspace and crossing the intervening distance between two points in another dimension (like the spacecraft in Star Wars do), is up for debate. The point is, Alan Virdon left Earth on August 19, 1980 and arrived at or near Alpha Centauri on the very same day. That is a distance of over four light years in the space of a few hours, far faster than George Taylor was traveling, thus proving that Alan Virdon's ship is far more advanced and has some form of FTL drive system. Did ANSA have a FTL drive system eight years after Taylor left Earth? It's possible. The evidence seems to indicate this. Look at the layout of Virdon's spacecraft again. No suspended animation chambers, no place to sleep or lie down unless the chairs also fold down flat to form crude beds. There's not even any real indication of storage space onboard for necessary items like spacesuits for EVA work or survival kits. 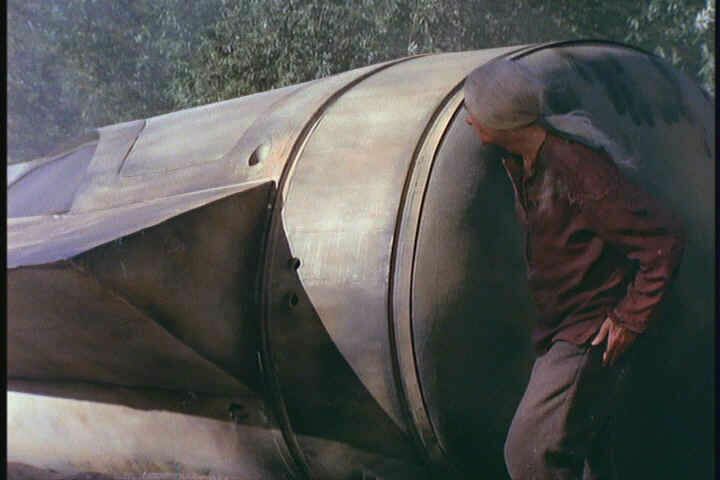 In fact, there is not even an airlock, meaning that this vessel is not intended to open its hatch unless in the presence of a 'friendly' atmosphere. Toiletry and basic hygiene systems also seem to be missing and are best left skirted at best with regard to the imagination. Virdon's spacecraft traveled at faster than light (FTL) velocity, with a speed possibly measured in at least a light-year per hour, possibly several light-years or even a parsec / parsecs per hour. Virdon, Burke, and Jones traverse through a form of time warp, similar to Taylor, yet they do not age as Taylor, Landon, and Dodge do. The crew of this advanced vessel don't even show a shadow of a beard when they arrive several thousand years in the future, thus again showing that this vessel did not encounter or cross a lot of objective time in its flight. Virdon's spacecraft was designed for short duration flights due to the lack of basic survival facilities (eating / sleeping / toiletry). It has no airlock and no obvious spacesuits, meaning that it was not intended to be opened in the presence of vacuum or any hazardous atmosphere or condition. Virdon's spacecraft was designed to be attached rather securely to a much larger power / drive section. Virdon's spacecraft had no access to this power / drive section from within the command module itself. The command capsule was completely isolated short of the port side entrance hatch. Virdon's spacecraft was designed to have access to the command module in one of two ways; through the main hatch activated from within, or from an emergency button in a recessed outlet available to emergency rescue crews in the event of primary command capsule ejection and subsequent recovery.